In honour and grateful remembrance of the men of Stevenage who gave their lives for King and Country in the Great War 1914-1919. 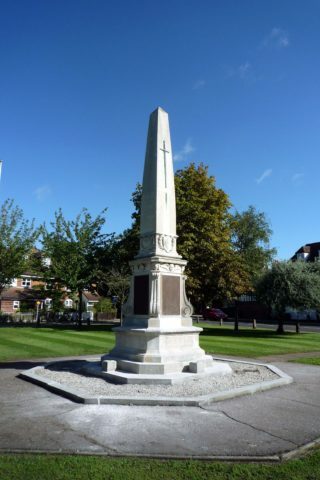 In the autumn of 1918 numerous letters were sent to the Hertfordshire Express newspaper concerning the choice of a suitable memorial to commemorate the men of Stevenage who were killed during the Great War. Mr W.H. Foster suggested an avenue of trees be planted with a label on each bearing the name of a fallen serviceman, plus that of the tree donator. A memorial club where returned men, injured or sound, could meet for recreational purposes was proposed by Mr F. Leonard. Mr W. Brignell expressed the hope that the memorial could be something useful such as a 50 bed cottage hospital. After a public meeting in February 1919 it was decided that a monument on Bowling Green would be most suitable. Also at this time the Trophies Committee of the War Office offered the town a captured German machine gun together with a “damaged” ammunition box and a “damaged” ammunition belt. Regarding their location in Stevenage one councillor frivolously suggested that it could be attached to a swivel to the drinking fountain on Bowling Green, but the offer of such small gifts was rejected as an insult and a request made that something more substantial should be given to the town. Other suggestions included the building of six alms-houses and the building of a small cottage hospital, or the erection of a monument. The building and equipping of a fifty bed cottage hospital was deemed to be too expensive, and an announcement from the government in respect of hospital building was expected shortly so the powers that be decided to build a stone memorial. Not everyone was happy with this however as letters to the Hertfordshire Express demonstrated with one reader deploring the erection of “a piece of stone” and suggesting that the building of a swimming pool would be more suitable. Mr C. F. Corbould- Ellis offered 27 High Street rent free for a year to be transformed into a smaller cottage hospital that with public funding would be suitable for 4-6 beds where the names of the fallen men could be engraved upon a tablet therein. In spite of the many objectors Stevenage Urban District Council decided to form a War Memorial Committee with Mr B.H.R. Daltry as Chairman. They hoped to raise £1000 for the building of the memorial with door to door collections. Arrangements were made for a deputation from a design sub-committee to take plans and photographs of the Bowling Green Site to the Royal Academy of Arts who were displaying an exhibition of possible War Memorial Designs. The memorial fund was launched at the beginning of May 1919 with an appeal for subscriptions. It was agreed that the memorial should not exceed 25 ft square and that the green should remain an open space. At the October 1919 meeting of the Stevenage Urban District Council the council heard that a field gun and carriage had now been offered to the town by the War Office Trophies Committee. It was proposed to place the gun carriage in The Avenue (one councillor suggested with humour that it might be put to better use on Letchmore Green keeping the caravans away !). Three designs for the War memorial were considered. A design by Sir Reginald Blomfield called a “ Cross of Sacrifice” which comprised a simple cross of Portland Stone with a Crusader sword on the face of each upright with the names of the fallen to be inscribed upon the base. A design by Mr Merryfield comprising a Celtic Cross. The design by Mr Wright was chosen with the following few modifications – the inclusion of military naval and air service emblems and a symbolised Christian Cross. Also at this meeting Mr Lowry expressed the hope that the “hideous Post Office pole and cable currently sited on Bowling Green”, could be moved elsewhere to avoid becoming an eyesore in the area of the memorial. Many discharged serviceman were still unhappy with the chosen memorial however, wanting something more useful to commemorate their fallen comrades. Their protests did not succeed in altering the plan, however they did form a very successful ex-servicemen’s club. In February 1920 Stevenage was offered further war trophies mainly captured rifles.They declined these but did take delivery of a German 150mm Howitzer weighing two ton 3 cwt. One suggestion for its location was in the grounds of Holy Trinity Church.The German guns subsequently found a home at Stanmore Road close to the ex-servicemen’s club, but local memory suggests that they were eventually dumped at the Council rubbish tip at Fishers Green. 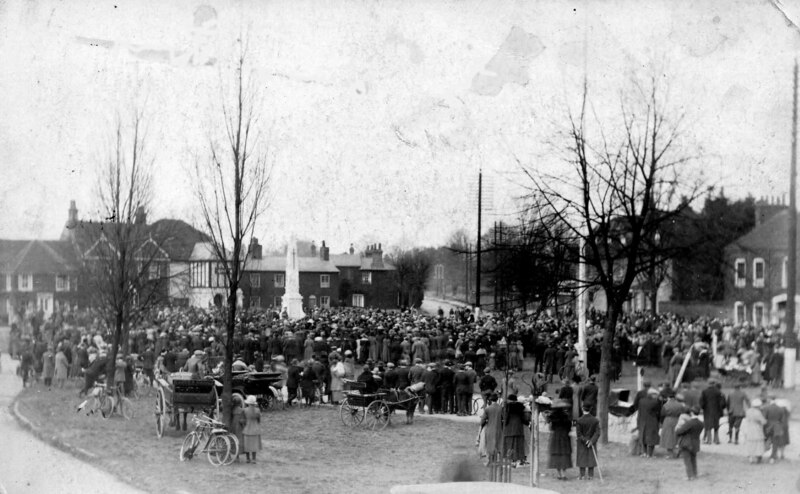 In August 1920 after a photograph of the proposed memorial had been displayed to the public, Mr Times the council Clerk placed an advertisement in the local newspaper requesting relatives of the Stevenage fallen to check the name and regimental details shown on a list on display in the council offices. They wanted no errors or omissions on the inscriptions to be engraved. On September 27th 1920 the foundation stone was laid. Arrangements were made for Brigadier-General Viscount Hampden to unveil the memorial on Bowling Green at 3.30pm on Saturday 19th March 1921. It was requested that ex-servicemen wear their war decorations, Red Cross workers wear their badges, and that flowers brought by relatives and sympathisers would be placed on the base. 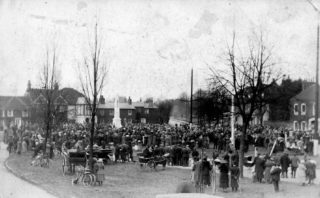 On Saturday 19th March 1921 the town shops closed during the 90 minute unveiling service and all flags were flown at half mast. Men from No 4 Company, First Batallion of the Hertfordshire Regiment led by Lieutenant Rowley M.C. formed the funeral party. The funeral party led by the regimental band played the “Dead March” and slow marched with arms reversed from the station to Bowling Green. The troops lined an enclosure around the memorial as the National Anthem was played and the Union Jack covered monument was unveiled by the Lord Lieutenant of Hertfordshire Brigadier General Viscount Hampden C.B. C.M.G. Many floral tributes were left on the base of the memorial including one in the form of a vacant chair bearing the inscription “In Loving Memory of our absent comrades from members of the Stevenage United Services Club”. A well known local resident present at the service was Rear Admiral Sir Thomas Fellowes K.C.B, who at the age of 94 appeared in full dress uniform. Sir Thomas who had entered the navy in 1845 lost two grandsons in the Great War. Please note the full report on the history of the War Memorial in Stevenage by Mr Amess is available for purchase at Stevenage Museum.